It's a Bank Holiday weekend and the forecast is for sunshine*. Bring out the BBQs. Slap on the sunscreen. Pour me an extra large glass of Pimms! But that's not the only reason to be cheerful this weekend. The Great British Bake Off returned this week, to a record number of viewers. The best joke at the Edinburgh Fringe Festival was one about chocolate (Rob Auton's: 'I heard a rumour that Cadbury is bringing out an oriental chocolate bar. Could be a Chinese Wispa'). We discovered M&M's Coconut, which my brother and his new wife kindly brought back for us from their honeymoon. Imagine the genius child of a pack of Smarties and a Bounty bar and you'd be halfway there. 2. Using a sharp knife cut out rectangles from the pastry, approximately 4 x 3 inches. Score a smaller rectangle about one cm from the edge of each pastry, taking care not to cut through the entire pastry. Happy Bank Holiday Baking! What are you switching the oven on for this weekend? * Apart from in the South East. East. North East. And all of Scotland. Sorry. 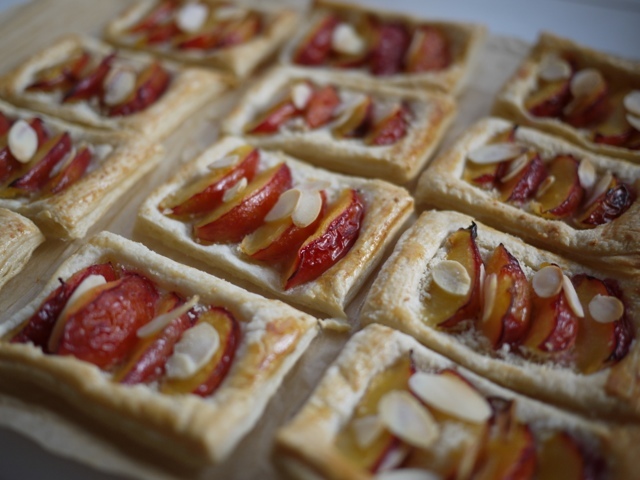 Oh these are lovely - great addition using almonds! We are on holiday at the mo but I have set our recorder so that we don't miss a second of the "bake off". Even so, I can hardly wait to get back home. Only joking !! 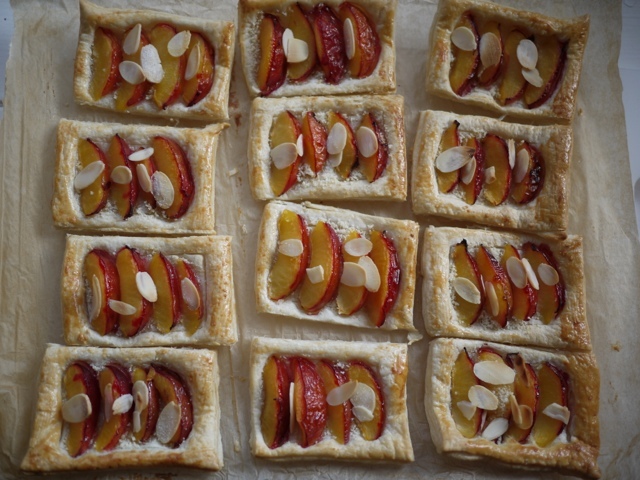 Lovely looking tarts - so pretty. WHat are these coconut M&Ms of which you speak...and where can I get them? These tarts are so cute and look scrumptious! You may have some of our sunshine from Colorado, I am so ready for my snow. These look yummy! So glad plums are in season as they are great to bake with and so juicy and delicious. A perfect simple dessert and one which makes the most of our lovely British plums. Add pastry and I will always be interested! These look so yummy! 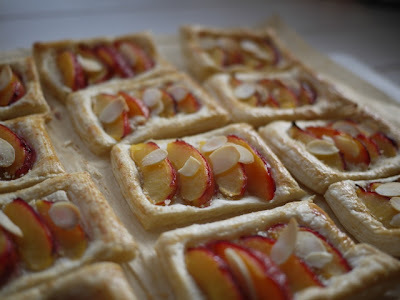 I like the idea of making them small - almost bite size as a little afternoon treat in the garden :) while the sun holds out of course. Those look gorgeous, so elegant! Almonds and plums together are such great combination!